There is much to be gained from using DC rather than AC as primary input for LEDs. Phil Kreveld explains the technicalities. We live in a 24/7 world, in which artificial lighting represents a huge part of humanity’s energy use. Electric lighting is mainly provided by alternating current (AC) with direct current (DC) being sourced from batteries and solar panels. In Australia and elsewhere in the ‘first world’ the development path has been to higher-efficiency lighting, with light-emitting diodes (LED) leading the way in energy conservation. 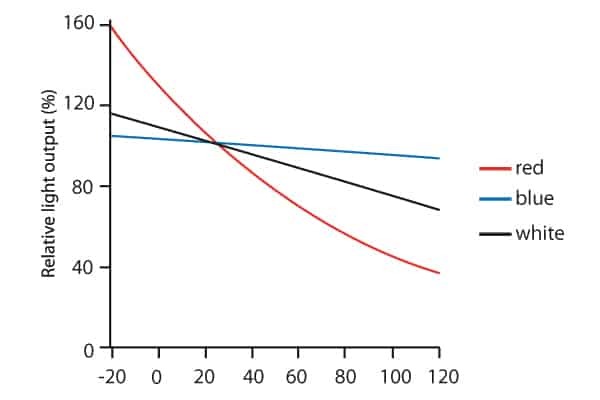 The luminous efficiency of LEDs far surpasses other technologies, and drawbacks such as colour and small angular dispersion have been overcome. However, we are not taking full advantage of the technology. We could be availing ourselves of more DC energy than is commercially on offer. There are substantial efficiencies to be gained by using DC rather than AC as primary input. 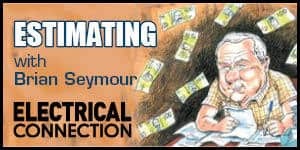 This article looks at short-term and long-term developments in the energising of LEDs and takes a brief peek at a world in which much AC low-voltage reticulation is being replaced by DC. DC is already being used with USB-powered LED strings – clearly a hobbyist’s venture but nevertheless an indication of things to come. 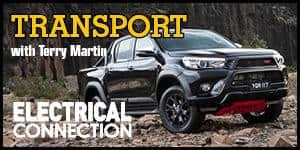 LED illumination products have become so well established in a relatively short time that the basic understanding of circuits and physical properties now seems unimportant. Yet these basics provide further insight into development opportunities for custom lighting designers and experimenters. The light-emitting diode is in many ways barely a diode. It quickly exhibits avalanche breakdown under reverse polarities of 5V reverse bias or more, therefore requiring protection against such events by means of clamping diodes. The basic operation in the forward direction is like that of any semi-conductor diode. By increasing the positive voltage in the P (acceptor) region, electrons from the N (donor region) are encouraged to flow to the P region. In LEDs electrons lose energy as they jump back from the conduction band to the ‘valence’, or bound region (where they form part of the bonding links between neighbouring atoms). This energy is emitted in the form of light quanta. LEDs are therefore very similar to photovoltaic cells, in which the reverse process takes place. However, the photovoltaic effect can also happen in LEDs. In fact, it can be used for testing LED wafers, thereby avoiding damage to delicate copper conduction terminals. In this relationship, q is the charge in coulombs of the electron, V is the forward voltage on the P-N junction, k is a constant (Boltzmann constant), and T the junction temperature (in Kelvins, i.e. absolute temperature). Io is the saturation (dark) current also flowing at reverse bias voltage. 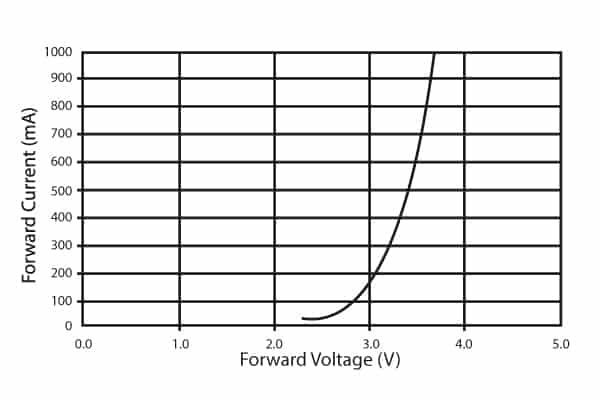 Light output as a function of junction temperature is shown in Figure 2, and light output as a function of forward current is shown in Figure 3. This graph shows typical behaviour which, not unexpectedly, is approaching linearity but should not be taken as applying universally, since packaging plays a large role in light output. From the equation for forward current If it is evident that it decreases with an increase in junction temperature, and light output also decreases. The light quanta emitted fall in fairly narrow wavelength bandwidths. Each light quantum carries an energy of hc/ where h is a constant (Planck’s constant), c is the speed of light, and , is wavelength. using a phosphor capable of producing effectively white light through the use of short-wavelength LEDs (about 470 milli-microns). In the latter method short wavelengths excite yellow colour in the phosphor, and the balance of blue light not absorbed mixes with the yellow to produce white light. The flicker fusion threshold of the human eye requires in practice a DC power source for LEDs. This is the case even though an AC voltage could be applied (bearing in mind that reverse voltages should be limited by clamping at a low reverse voltage level). LEDs fire and switch off essentially without delay (unlike incandescent lamps or fluoros powered by electronic ballasts) operating at frequencies of 20kHz or higher. This makes for uncomfortable viewing at AC power frequency. However, by virtue of DC power being the natural choice, higher ’system’ efficiencies can be obtained. Although DC power is generally more efficient than AC, the difference is not great. Furthermore, it is a theoretical consideration inasmuch as it cannot practically be employed other than for a fixed distribution voltage. Yet by eliminating needless conversions al low voltage levels, worthwhile energy savings can be made in practice. As replacements for dichroic filters, LEDs come with a bridge rectifier circuit as a built-in feature so that they can make use of the same 12V AC transformers. In some cases an attempt is made to provide better impedance matching between the LED luminaire and transformer. However for commercial installations, DC power supplies are the preferred solution. 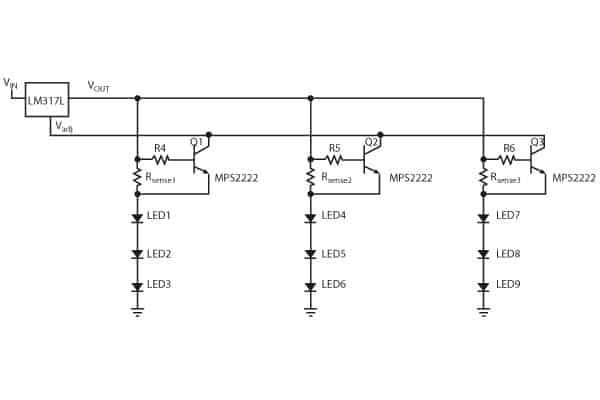 At a typical forward voltage of 3.3V, a string of eight LEDs requires in excess of 26V. For lower voltages, fewer LEDs can be incorporated, or parallel connections must be employed. The latter topology can exhibit problems with unequal current division, as there will always be some differentiation between individual LED forward bias characteristics. Variation in forward voltage can be about 20%, so significant voltage differences can occur on series strings. To ease the difficulty of paralleling strings, LED manufacturers make use of fairly elaborate binning procedures. The aim is to match LEDs on the basis of forward voltage and also for current-luminous flux and spectral distribution. In many embodiments of luminaires for commercial and industrial use, reliance is placed on LED drivers for correct biasing, rather than on the selection of matching components. In larger power luminaires, a combination of parallel string clusters is employed (Figure 4). For these arrangements care must be taken to provide current balance in the strings. Ideally, current balance is provided through the use of constant current sources. The simplest arrangement for a constant current source is the use of a high-value resistor, but a relatively high voltage is then required. In practice a constant current source relying on feedback is the best solution. 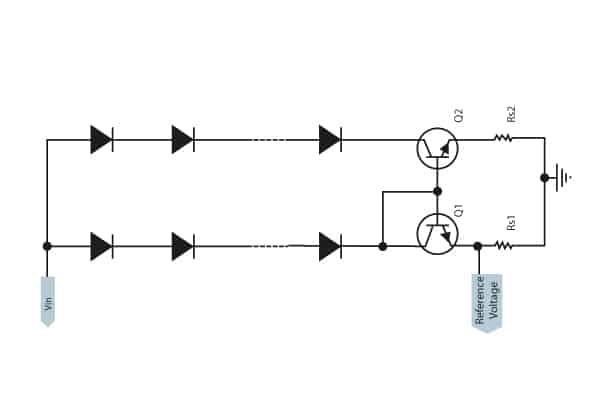 To achieve this a power supply with feedback is employed, as shown in Figure 5. The current regulator requires a constant voltage on the sense rail so that all three LED strings draw the same current. Should an LED open in one of the strings, excess current in the remaining ones should be avoided. This is achieved by using switching transistors Q1, Q2 and Q3, each with its own sense resistor. If an LED fed by Q3 opens, the base and emitter of that transistor are ‘commoned’, opening up the collector. Note: the LM317 is a popular Texas Instrument product. 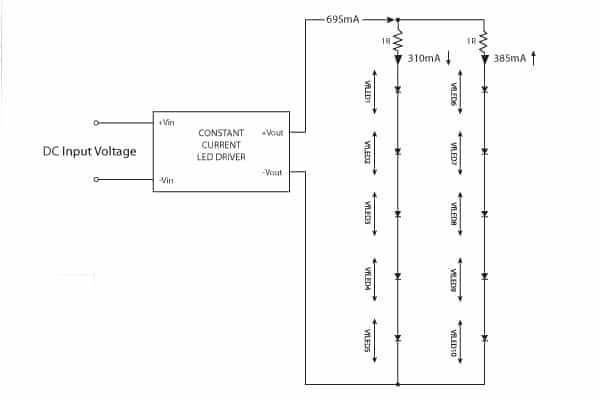 However, such linear current regulators have low efficiency, thus negatively influencing what is gained from the high inherent efficiency of LED luminaires. The switch mode form of current regulator is not only more efficient but also provides for basic dimming capability. The basic circuitry is shown in Figure 6. The LM555 is a Fairchild device for generating accurate time delays and oscillating waveforms. In the illustrated circuit the device is used as an oscillator, generating a square wave in conjunction with R1 and C1. R1 is a potentiometer and allows the frequency to be varied. When the output of pin 3 of the LM555 is low, transistor Q1 turns on and the inductor L1 stores magnetic energy while the LED conducts current. When pin 3 goes high, Q1 switches off but the LED is still being supplied with current via the L1 stored magnetic field. 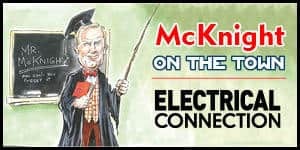 Providing constant current is one thing; splitting current equally among several LED strings connected in parallel is another, and it becomes important in large luminaires. That task can be achieved by current mirrors. A current mirror is a circuit block that functions to replicate the current of a particular active device in another active device. An important feature of the current mirror is a relatively high output resistance, which helps to keep the output current constant regardless of load conditions. 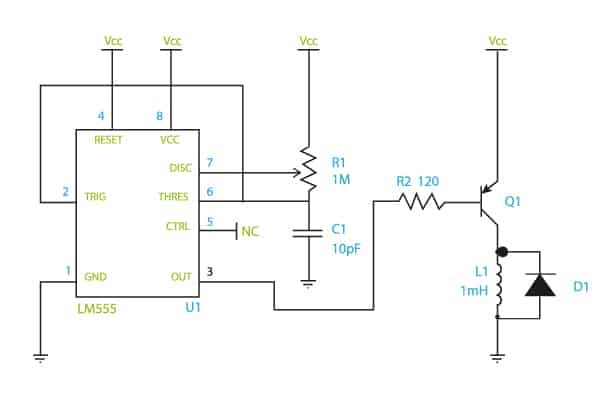 Another feature of the current mirror is a relatively low input resistance, which helps to keep the input current constant regardless of drive conditions. A current mirror is shown In Figure 7. The sense resistor RS1 in the left-hand LED string sends a feedback voltage to the current regulator (not shown) feeding both strings. Transistors Q1 and Q2 are identical types and ideally should be mounted on a common heat sink so that their thermal characteristics are matched. Transistor Q1 with its collector connected to the base is turned on hard and supports only a small voltage difference between emitter and collector. Q2 is basically an emitter-follower circuit, that is, it replicates the base to ground voltage on the sense resistor RS2. Therefore RS2 will be equal to RS1 in value or adjusted to be very close in value. In this way both strings draw equal current. Further strings can be added, and appropriate transistors must be chosen for that task. Although it is simple circuitry, several disadvantages can arise. One is that matched transistor pairs are generally limited in power (thus limiting string current). Another is that larger differences in total forward voltage in strings can also limit current. If, for example, the left-hand string has a larger voltage drop, the difference shows up in a larger collector to emitter voltage drop on Q2, thus limiting current in that string. A more flexible form of individual string current control is shown in Figure 8. In this circuit the two strings have the same supply voltage, as in the current mirror example. This voltage can be set at a level appropriate to the largest of forward drops likely to occur – and even to allow for a bit of extra ‘headroom’. The field effect transistors (FETs) (Q1 and Q2) can be thought of as trimming resistors. The operational (high gain) amplifiers feed the base regions of the FETs. 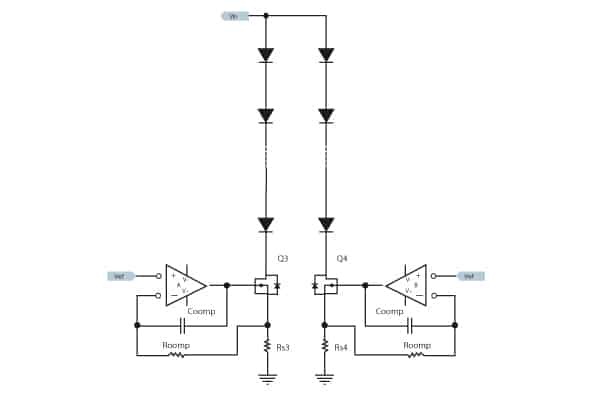 By eliminating the difference signal (connected to the negative input), the voltage drop – and therefore the current – is kept constant on the sense resistors. Is DC the efficient solution? The short answer at present is no, but there are some important qualifiers. The first is that there isn’t a range of commercially available DC-DC power supplies for LED lighting. What we have is a plethora of drivers, all of them with AC input. Typically the spread of power ratings is from a low of a few watts to 200W, with a maximum voltage about 60V volts and a maximum current of 4A. The larger the driver, the more likely it is to be of higher efficiency. For larger drivers, efficiencies quoted in engineering articles are in the high 80% range. 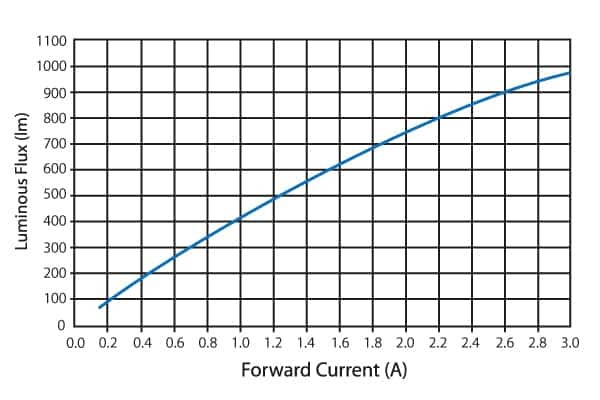 Figures are not readily available for the low end, but common sense indicates that with magnetising current forming a much larger part of small transformer input current the efficiencies will be 10 percentage points lower. With the increase in rooftop photo-voltaic installations, the drop in feed-in tariffs, and the rising sales of battery storage systems, can DC input power for LED lighting be far off? Is there any sense in supplying the nightly load of lighting by inverter-generated AC only to convert it back to DC? One efficient DC-DC converter for the home would take care of business.